A forgotten history from a forgotten front of WWI is the core of a fascinating book by the Italian historian Luca Gorgolini, who has reconstructed the human odyssey of a group of Austro-Hungarian soldiers, imprisoned in the Balkans and then deported to the Asinara, a little island close to the north-eastern coast of Sardinia. But let’s start from the beginning. Fall 1915, the German and Austrian-Hungarian Armies from north and the Bulgarian Army (which has just gone to war) from east attacked and finally occupied Serbia during their third offensive action. The first two aggressions, at the beginning of WWI, did not succeed in having the upper hand over the Serbian resistance and many soldiers of the Empire were captivated. Already at the end of 1914 they were more than 60.000 – an impressive number for the small Serbia also in normal condition. Can you imagine what it was like after 6 months war, when the uninterrupted military effort and the progressive isolation of Belgrado had exhausted the whole country? No adequate prison camps had been arranged and scarce resources were assigned to an alternative arrangement of the war prisoners. German and Austro-Hungarian soldiers were usually mistreated and robbed (even of their clothes), employed in civilian or military works; moreover they often starved. Lastly their tragic conditions deteriorated because of epidemics: as soon typhus, smallpox and dysentery spread, these prisoners were decimated. Then the invasion and the retreat. When Belgrado was occupied in October 1915, the Serbian government, army and population were put to flight. Not only the literature, already the contemporary witnesses speak about a “huge retreat”: the tragedy of a flood of people leaving their homes, blocking the muddy roads with their poor furnishings and goods; a lost and scared humanity, who had no idea of the future and was just seeking a first refuge in the neighboring countries of Montenegro and Albania. Among this crowd there were also the Austro-Hungarian and German prisoners, who were forced to march together, since the Serbian leaders didn’t want them to enlist once again or support their homeland. Even the sick ones were pushed to escape and to suffer together with the companions the lack of even the essentials. Many of them perished during the retreat due to hunger, cold and illness. The survivors beached instead along the Albanian coasts, like hopeless waves of that human storm. But the odyssey was not at the end. When the German and the Austro-Hungarian armies entered short after the Montenegro and approached Albania, the evacuation of the exiles became urgent. The English, French and Italian navies immediately organized the transfer of Serbian civilians, politicians and soldiers for example to the Isle of Corfu. The German and Austro-Hungarian prisoners represented instead an international problem. They had to be moved out as soon as possible, but over their custody quarreled France and Italy. Italy strove for a predominant role in the Balkans and claimed the right to manage the emergency. It finally took the prisoners into custody, appealing to its special mission, which run in Valona since December 1915. Unfortunately the political ambitions didn’t match the effective resources required for their assistance. Mid December 1915 the first German and Austro-Hungarian group of prisoners was transferred to the Asianara, a small and arid island near Sardinia, where a medical centre and isolation ward for infectious diseases had been established since 1885. It was in fact clear that those soldiers represented first of all a sanitary emergency (most of them suffered a severe form of cholera infection); therefore they should be transferred in small groups – the medical complex of Asinara could in fact host 1.000 patients at most –, disinfected, kept in quarantine, treated and, when restored to health, transferred to other prison camps in Italy, letting so another small group to be aided. But the war situation in the Balkans quickly deteriorated and also the health conditions of the prisoners stuck on the dock of Valona degenerated in the risk of contagion. Regardless of all medical procedures, between 16th and 30th December 1915 21.388 prisoners were transferred with 10 steamships from Valona to the Asinara; and then again about 2.618 soldiers between 2nd January and 8th March 1916. 24.000 men reached the little island in only 8 weeks. It should be enough to recall this fact (24.000 in 8 weeks!) to figure out the tragedy that follows. Only during the trip, which lasted about 2 days, more than 1.500 men who had been infected already in Valona died. Many passed away on board, while the steamships waited for docking in the roadsteads in front of the Asianara Island, which was flooded by the sick prisoners and, due to the lack of facilities and military and medical staff, couldn’t receive the German and Austro-Hungarian soldiers as soon as they arrived. The tiny spaces of the boats, the difficult living situation, the trip and above all the precarious sanitary condition let the epidemic spread, so that the captains were often forced to throw the corpses into the sea. Even on dry land the cholera infection did not ceased: from 7th to 14th January 1916 more than 1.300 prisoners died. There was no water, no adequate supplies, it was winter and the prisoners (no matter if ill or not) were gathered in tent camps; also the medical staff and equipments were insufficient. All these elements contributed to the massacre: 7.000 prisoners died in the first 3 months. Such frightening numbers make us understand the tragedy of “the damned of Asinara”, as Gorgolini entitled his study (I dannati dell’Asinara, Torino 2011 – a German translation by Günther Gerlach is also available: Kriegsgefangenschaft auf Asinara, Innsbruck 2012; also a Serbian version will be released at the end of Juni: Проклети са Азинаре, Prometej, Novi Sad, 2014). And yet the great value of this work is not limited to the detailed description of the historical context, to the analysis of the odyssey of these soldiers in the broader framework of the war prisoners during the Great War (and yet this phenomenon in general has still to be satisfactorily investigated, as also Gorgolini points out), or to the examination of the official reports and the officers’ accounts (all significant merits we have to recognize in this book); it is also and above all the diaries and memories of the prisoners, which the author constantly quotes (for example the diaries of a Czech soldier, Josef Šrámek, and an Austrian one, Josef Robinau) that make this book – and above all the last chapters – a vivid reconstruction of the hell, which these men went through. The Asinara Island became a circles of Dante’s Inferno: a city of tents, of improvised shelters for the exhausted prisoners, who suffered from hunger, thirst, physical (above all cholera, but also other epidemics) and psychological (mental disorders and depressions among prisoners are also discussed) diseases, the rivalry among the different national groups, the brute struggle for existence. At the same time the author does not neglect to highlight that a shared culture and everyday routine have developed in the island, newspapers – no less than with satirical content – were published, for example, and the correspondence with home became a life line. 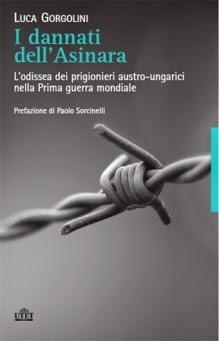 We could recall other details of Gorgolini’s book, but in conclusion we content ourselves to stress that this is a precious work, which shows us the great importance of the good historical research, as this one is; a book, which has be read in order to discover another piece of the WWI mosaic.